Last week, nearly a thousand people gathered in Town Hall to witness the debate on rent control. The atmosphere was tense and the crowds were restless, highlighting how pressing the issue of housing affordability in Seattle has become. Seattle City Councilmembers Kshama Sawant and Nick Licata led the argument in favor of rent control. 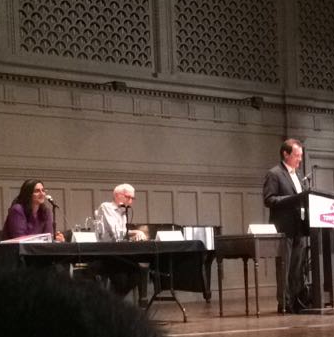 Both Sawant and Licata described the severe burden that the increasing rent prices are placing on low-income households, and called for the need to limit these large price hikes through the rent control policy. State Rep. Matt Manweller and Roger Valdez, a developer lobbyist, painted a far more negative side of rent control. They explored rent control in cities such as San Francisco and New York, linking the policy with the rise of dilapidated housing and the lack of housing growth in these areas. For them, the problem is centered on the widening disparity between supply and demand, and rent control does not address this. However, addressing housing affordable is never that simple. Housing affordability has been a growing problem in Seattle since the late-1970s, and is only getting worse. Even so, history and experts are not on the side of rent control. The debate was held in a very crowded Town Hall on July 20th, 2015. In a rare consensus, nearly 93 percent of economists agree that rent control creates more problems than it solves. Nevertheless, Sawant and Licata are convinced that it can work. Each city is unique, and it is impossible to predict whether such a policy would work. However, if any city could break the pattern, my bet is on Seattle. This blog post was written by Allen, a rising senior at Duke University and the Bus’ 2015 DukeEngage Intern. 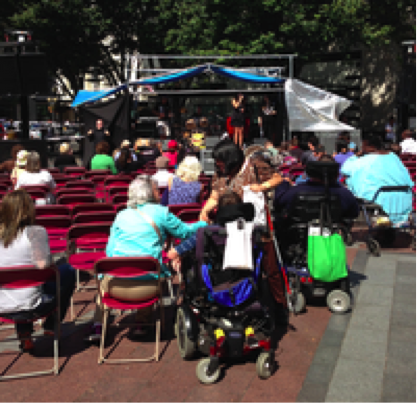 On July 22nd, Seattle celebrated the 25th anniversary of the Americans with Disabilities Act (ADA) in Westlake. The first part of the event was devoted to the recognition of donors, sponsors, volunteers, and speakers, and the second half was devoted to a rally. Over ten organizations volunteered, and the event was sponsored by a number of corporations, government affiliates, and independent donors (I.e. SPD, City Council, the City of Bellevue, Starbucks, Boeing-which-did-not-show-up, etc.). One speaker evocatively explained how she had developed a debilitating, “invisible,” disability, or a crippling anxiety disorder, and was able to benefit from the ADA in ways previously thought unimaginable. She claimed, “If it were not for the ADA, [the act] which told my family and my friends, and frankly me, that having a disability is nothing to be ashamed of, I would still be governed by my disability today.” Instead, she is making a difference in Washington State, by servicing those living with disabilities, and engaging folks on the importance of the ADA across the state. Her story dually speaks to the ADA’s protections for those living with mental illness. Several politicians spoke to the importance of the ADA. Patty Murray, a Washington senator strongly in support of disability rights at both the state and national levels, left an audio message. She stated, “We have so much to celebrate today, but we must also think about what more can be done.” Murray is working to reauthorize the Elementary and Secondary Education Act (ESEA) so that students with disabilities have the opportunity to “work and grow and thrive,” in an increasingly inclusive environment. On a beautiful sunny day, the ADA was celebrated in a crowded city square—visible, potent, and necessary. Last Saturday, we had the opportunity to visit Plymouth Housing Group, an organization that serves some of the most disadvantaged homeless adults in Seattle. During this visit, we learned about the organization’s unique approach towards tackling homelessness. 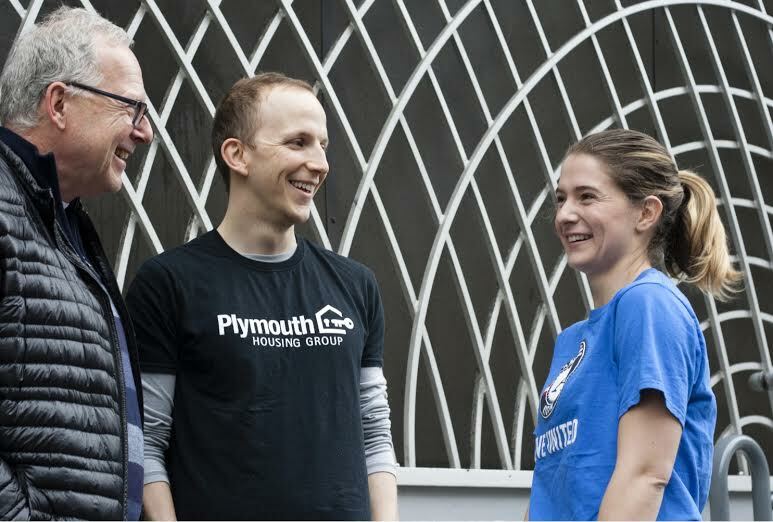 Plymouth operates under a “housing first” philosophy, which focuses first on bringing people off the streets and into stable and permanent homes. 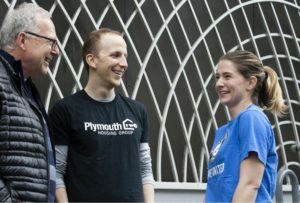 This means that individuals who often have no other options for housing – drug addicts, the chronically ill, and the disabled – can find a home at Plymouth. By lowering the barriers to housing, and accepting those who are struggling the most, Plymouth acknowledges the challenges that come with homelessness and aims to tackle the issue at its core. What struck me the most was the extent to which Plymouth went to try to make their tenants feel at home. As part of our visit, we helped make welcome posters and calendars for new residents, to provide a more welcoming and comfortable touch to their new homes. The idea is that by prolonging their stay, tenants will have greater opportunities to seek the supportive services that they need and build towards a better and more stable life. So far, the hard work seems to have paid off. According to Winona Caruthers, the Community Engagement & Housing Stability Coordinator, nearly 98% of tenants remain with Plymouth after one year. 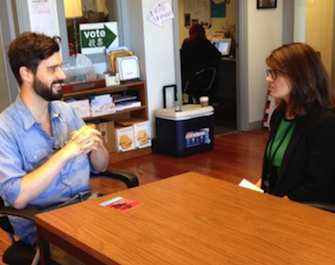 Today, Plymouth is serving more than 1000 formerly-homeless people in its facilities. However, there is still much work to be done. The problem of homelessness remains rampant in Seattle, with nearly 4000 people still living on the streets – a 20% increase from 2014. At Plymouth, waitlists extend through several years, and have even closed. This poses many questions: Are we taking the right approach? Are we tackling homelessness at its source? What is the source? The city and non-profits certainly have a complex problem to address. Whatever the answer may be, volunteering at Plymouth has shown me the value of incorporating kindness and humanity into this solution. Recently, I attended a City Council Committee Meeting on public safety, civil rights, and technology. There were some 60 attendees in addition to Committee Chair, Bruce Harrell, council member, Jean Godden, and Chief of Police, Kathleen O’Toole. Last time I checked, gender makes a difference everywhere – even in a city as comparatively progressive and proactive as Seattle. Harrell, are you familiar with the host of LGBTQ hate crimes happening in and around The Hill these days? Unequal wage gaps? Apparently, you aren’t. For now, allow me to debrief on a few of O’Toole’s main points on the SPD’s efforts to augment police accountability. So far in 2015, the SPD has not been involved in officer shootings and other violent disputes (phew). The SPD has implemented an Early Intervention System (EIS) to enhance officer accountability. O’Toole stated, “[the EIS] is a way to identify an officer’s abnormalities before he/she becomes problematic.” And yes, we’ve seen “problematic” from sea to shining sea. The SPD mandates de-escalation training as a part of its police academy, in efforts to “use deathly force [only] as a last resort so that officers have the tools to effectively de-escalate a dangerous situation.” While reminiscent of the “talk a man off the ledge” strategy, popularized in films and literary account of sorts, O’Toole argues that de-escalation has been largely successful to date. The SPD is going #Social #WorldWideWeb, via “trying to get better at telling [its] story,” says O’Toole. She is proud of the SPD’s new social media presence (FB, Twitter, etc.). Personally, I’d like to see an Instagram account titled, “TheCopCar98105,” but we’re not there yet. 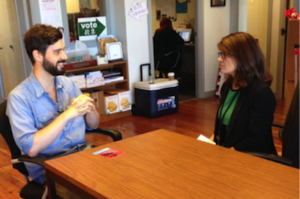 The SPD is working to align its statistical data with Seattle’s 57 distinct micro-communities. 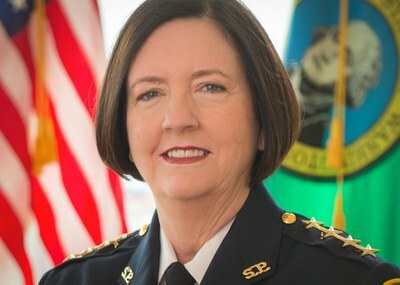 Each neighborhood has its own set of diverse challenges, that O’Toole and fellow officers believe should be uniquely addressed. Kudos! A new (mysterious ghost) IT man is working to develop “agile policing,” or the use of data from previous events to render new protocols. O’Toole says that this will help to “rapidly deploy resources through the use of technology” (like drones, but not). Community outreach is in. So is police recruitment. The SPD has the most “…diverse police explorer program in the state” for young people (like, 4th graders) to “…learn about policing… and to see if it’s right for them.” Forest Fire Fighting (yes, the FFF) was “right for me” when I was that age, but unfortunately, things change. Anyways, the program is diverse, and “targets historically underrepresented groups,” says O’Toole. O’Toole signed off (kind of) with these inspirational words, to soon be etched upon the back of a Pottery Barnes pillow – “I like to emphasize that prevention and intervention are always more important than enforcement.” #True.